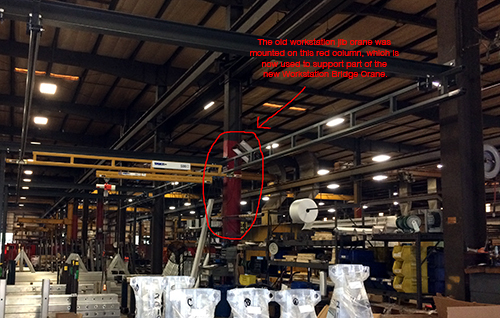 The Spanco Morgantown facility needed a system to replace our outdated tie-rod workstation jib crane for production and shipping. The workstation jib couldn’t reach the necessary coverage area and was utilizing old brackets, making it inefficient and difficult to move. 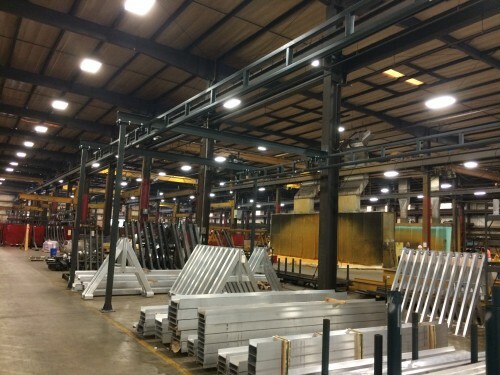 In 2014, Sue Webber, Spanco’s Aluminum Gantry Crane Shipper, reached out to Production Manager Chris Moke to request an overhead lift system that would cover more workspace, improve production, and save time when assembling, packaging, and transferring systems to the end of the building for easy loading and shipping. 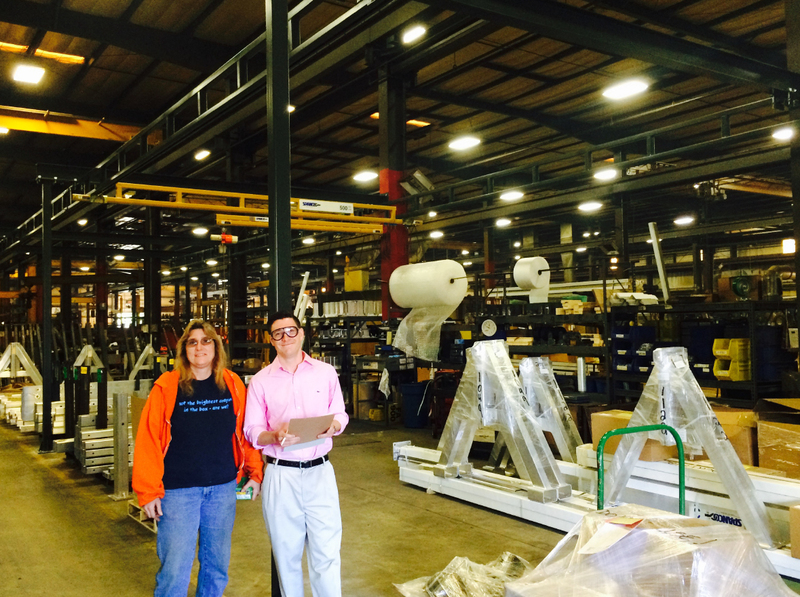 Chris Moke met with Spanco Technical Sale’s Specialist Eric Roeske to come up with a system that was ergonomic, effective, and easy to use. Together, they decided that a customized overhead workstation bridge crane would be the best solution to meet their needs. Chris and Eric took measurements of the specific coverage area, looked over the numbers, and assessed the shipping needs of the facility. 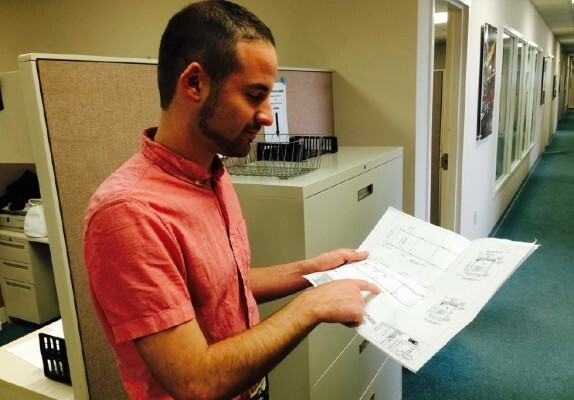 Eric filled out a sale’s order outlining the shipping department’s particular needs. That’s when Chris reached out to Spanco Mechanical Engineer Jon Rees to design and customize the perfect system for their specific application. Jon looked over the sale’s order, along with the drawing Eric sketched for reference, and came up with an ergonomic, unique system that provided maximum reach without obstructing walkways. After the new system was customized to meet space requirements and save production time, the job was approved and handed over to Maintenance Supervisor Brian Fleck and Maintenance Assistant Wes Groves. Brian and Wes were tasked with assembling and installing the system, which was uniquely designed to use both existing building columns, along with a total of five new support columns. The new system includes two Freestanding Workstation Bridge Cranes that connect to create one fluid system with a maximum rated capacity of 500 pounds. The total runway length for both cross sections is nearly 66 inches, and each runway cross section boasts a bridge span of 16 feet. The first cross section was customized with a telescoping bridge that extends four feet into the walkway to access hardware for assembling and packaging products. One side of the system includes three pre-existing building columns and one newly installed support column. The other side of the system includes four newly installed support columns. In order for the system to work in our facility, Jon had to design custom headers and mounting plates, which are bolted to pre-existing columns. This unique design was born from the collaborative efforts of Production, Sales, and Engineering. The reach of the old workstation jib crane was inadequate for this application. If workers wanted to package and transfer aluminum gantry cranes for easy shipping, they had to use the top-running cranes in the facility. But, those cranes are not only difficult to move, they are also limited and in constant use. Installing a system to cover packaging and shipping has improved productivity ten times over for our employees, for the truck drivers who ship Spanco products on a daily basis, and for the end users who rely Spanco to consistently ship their products in a timely manner. Accurate and consistent shipping times has always been a priority for Spanco, and now—with the help of our newly customized Workstation Bridge Crane—accomplishing precise and speedy shipping and arrival times has never been easier.